L 90-105 cm, WS 173-205 cm. Breeds in vast, swampy forests, mostly in aged mixed coniferous forest interspersed with rivers and marshes. Nest of sticks high in tree crown. Shy and withdrawn at nest site. 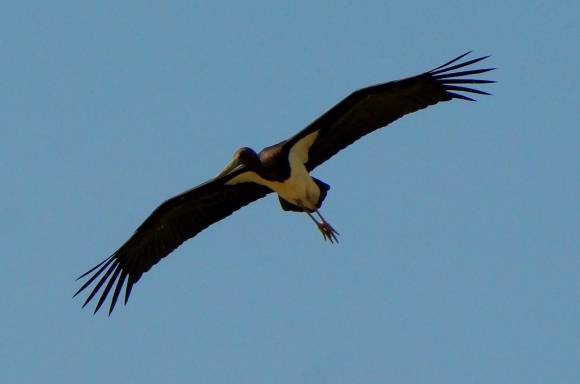 Summer visitor, winters in Africa; migrates a month later than White Stork, returns in May. Food mainly amphibians, insects. IDENTIFICATION: Barely smaller than White Stork, which it resembles in shape. At close range, easily told from White by black head, neck, breast and back with metallic green or violet gloss. In flight at distance the differences can be more difficult to see than expected; note that underwing has only white triangles on axillaries. - Adult: Bill and legs red. - Juvenile: Bill and legs grey-green. VOICE: Seldom heard owing to discreet nesting habits and shy behaviour. At nest gives rasping series, ‘shi-luu shi-luu shi-luu …’, with first syllable hoarse, second clear. Said also to have a buzzard-like mewing ‘piu’. Billclappering quiet and rarely used.